My subscription was cancelled by mistake, what to do? How to extend/change number of accesses? How to consolidate more subscription into one? Because primaERP is used and sold worldwide, we do not handle payments by ourselves, but rely on a partner. All your payments are therefore handled by Digital River (www.digitalriver.com), the world´s leading provider of e-commerce solutions, by using its application called Share-It. Cooperation with Digital River ensures that your data is safe and you can see all your orders, invoices and payments at any time. Payment methods vary from one country to another. Credit cards are accepted worldwide. In some countries, it is possible to also pay via wire transfer. You will see your options during the ordering process. Subscriptions for a longer period are financially more favourable. Choosing an annual subscription can save you more than 15% and the 3 year subscription can save you more than 30% in comparison with the monthly subscription. You can order additional accesses directly from the application by clicking on the settings icon in the upper right corner and selecting ‘Accesses’. On the next page, click the large button ‘Buy additional accesses’. 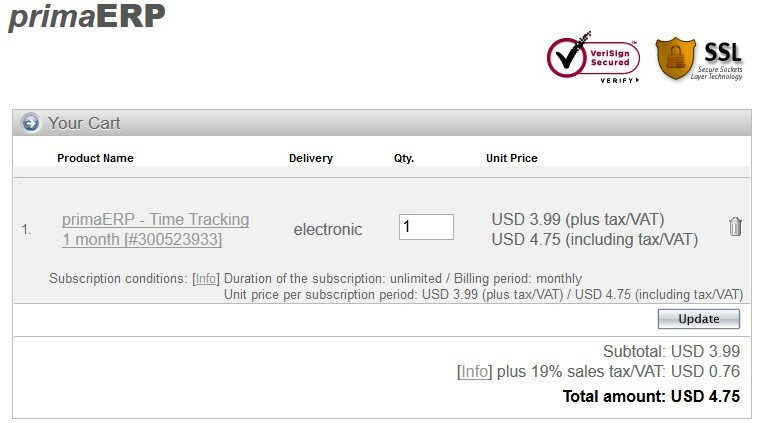 In the following dialog choose the subscription plan (see above), and the number of subscriptions you want to buy. Then click the button ‘To the payment’ and you’ll be redirected to the Digital River web portal to provide the payment (the address should start with https://secure.shareit.com...). The application looks kind of like an e-shop, where the product is the subscription item. The form consists of several parts. In the first part, you can see the subscription you have chosen (you can still change the number of accesses here). In the next part, you can fill in the data about your company / person. If you are buying for the first time, enter all your data carefully, because it will be used on your invoices in the future. 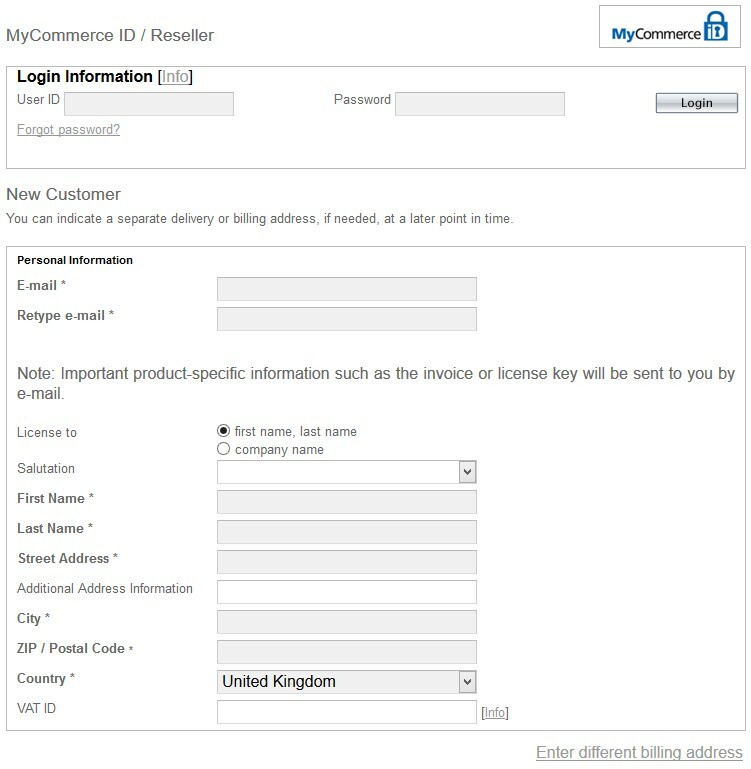 If you want to check your account and invoices or are buying for a second time and saved your account details from your previous purchase, you can login with your e-mail and password (see next paragraph) and your company data will be recalled from the client database. 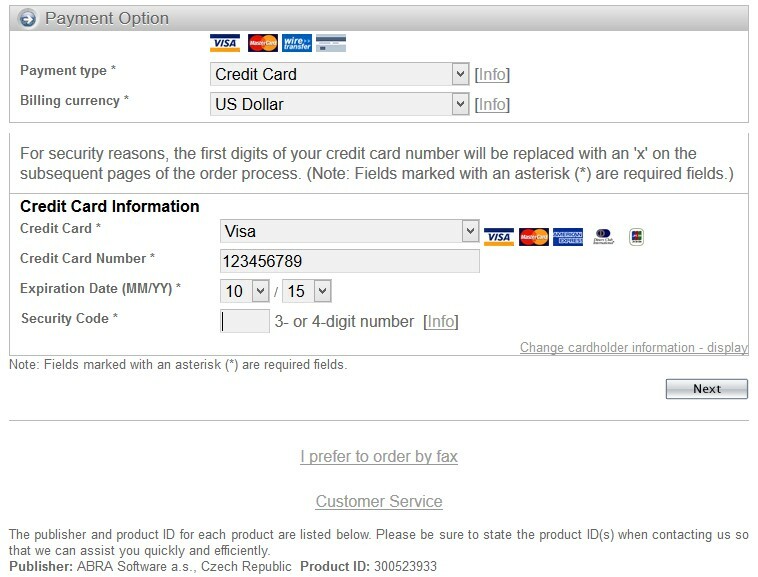 In the last part, you can choose the payment type and fill in other details needed for the payment. Continue with the ‘Next’ button. In the next step, you will see all entered data - addresses, ordered items, payment data, and you can check if everything is correct. In the next part of the form, you can create your personal client account, so that for further purchases or checking the account, you can only login by your e-mail and password and you don't need to fill in all data again. We strongly recommend to do so, because with your registered account, you’ll also be able to log-in later and see a list of your orders and other useful information. You can also cancel the subscription here. Therefore, please remember your login name and password for later use. In the next part (Additional information), you can check the boxes for the Share-It product newsletter (optional and not present in all languages). The next part (Subscription conditions) is important for the monthly and annual subscriptions regarding the automatic recurrence of the subscription. You should have to check that you agree with the automatic payment every month / 12 months. Last (obligatory) check is needed to agree with the general terms and conditions of Digital River. You finish the purchase by clicking the ‘Buy now !’ button. The purchase is finished (may last a few seconds)! After a short while, you will see the confirmation of the purchase page. As part of the confirmation message, in the middle of the screen, is also a printable version of the invoice (in the pdf format). We recommend you to click on the icon of the printer, display the invoice and immediately print it for your accounting. But you can also do so later (see paragraph 5 and 6). 5. What happens after the payment? After the verification of your payment, we will confirm your access extension and automatically enable the possibility to give the accesses to the new users. The verification of your payment may last up to 4 hours, although it is usually much faster for credit card payments (minutes / seconds). Please wait until your payment is verified. After this, your accesses will be immediately extended. (You don't need to enter any license codes from the delivered e-mails). You will also receive a confirmation message to the e-mail address you entered on the order form from a sender called ‘Share-it! Notification’, with the subject ‘Information about payment’ plus the Share-it order number. This message gives you a recap of the order you just made. There are also important links at the end of the mail, in the section Customer Service – the first link is to the Share-It FAQ, where you can find useful answers to questions concerning orders, payments and invoices. The second link with the heading ‘Your order data’ is also very important. Through this link you can access the Share-It client web application in order to log in to your account, see a list of all your orders and do other operations, which are mentioned later. 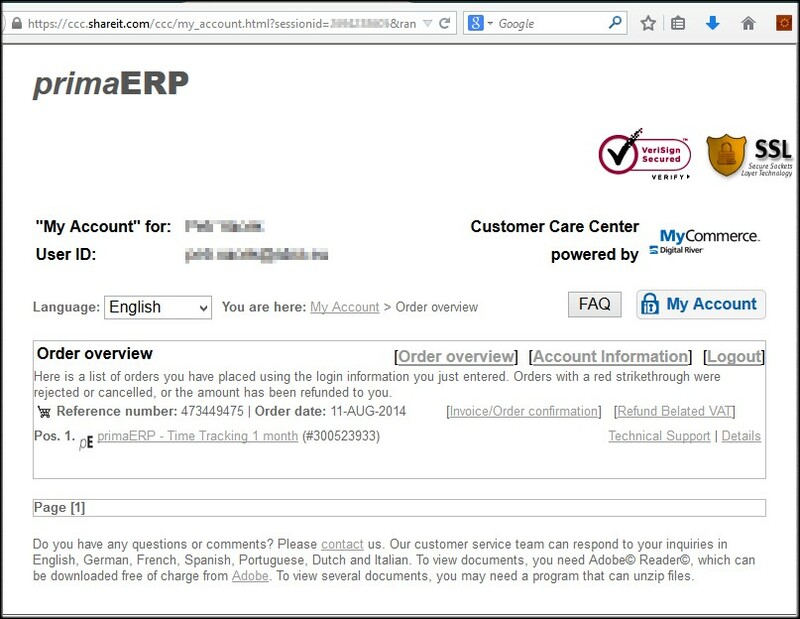 This e-mail has also two attachments – the invoice in pdf form and the Terms and Conditions document, also in pdf. We recommend you to keep the e-mail as you may need it later for working with your account, especially the link below the ‘Your order data’, which we will later refer to as a ‘Link to the Digital River web client application’. 3. Anytime after you can always use the link to the Digital River web client application. Here you can see the list of all your orders (use the link 'Order overview' to go back to this list at anytime ). 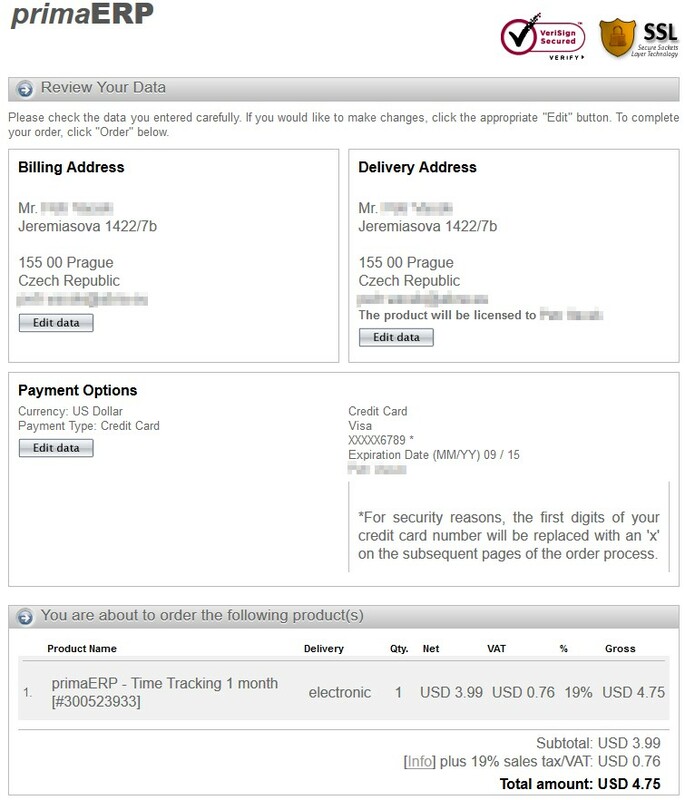 Clicking the link “Invoice/Order confirmation” allows you to review and print your invoice at anytime. If you find a mistake on your invoice (incorrect tax rate for your country, missing or not required VA, etc), please be aware that we can’t handle this; the correction has to be made by Digital River. You can either ask them directly by contacting their support by e-mail or you can ask us and we can redirect the request to Digital River and keep you informed about the solution. Usually this kind of problem is solved with a refund within a couple of days. If you have chosen to pay for the original order with a credit or debit card, Share-it will automatically send you an e-mail to remind you of the upcoming automatic billing for the subscription. If you don’t object to the automatic re-billing and the correct amount is successfully charged to the card, you will be able to continue using primaERP without any interruption. If you have chosen to pay by wire transfer, check or cash, you will receive the payment notification from Share-it in time before the payment is due. This notification mail contains all relevant payment information. Following the payment, you will receive your invoice and payment confirmation via e-mail. 9. 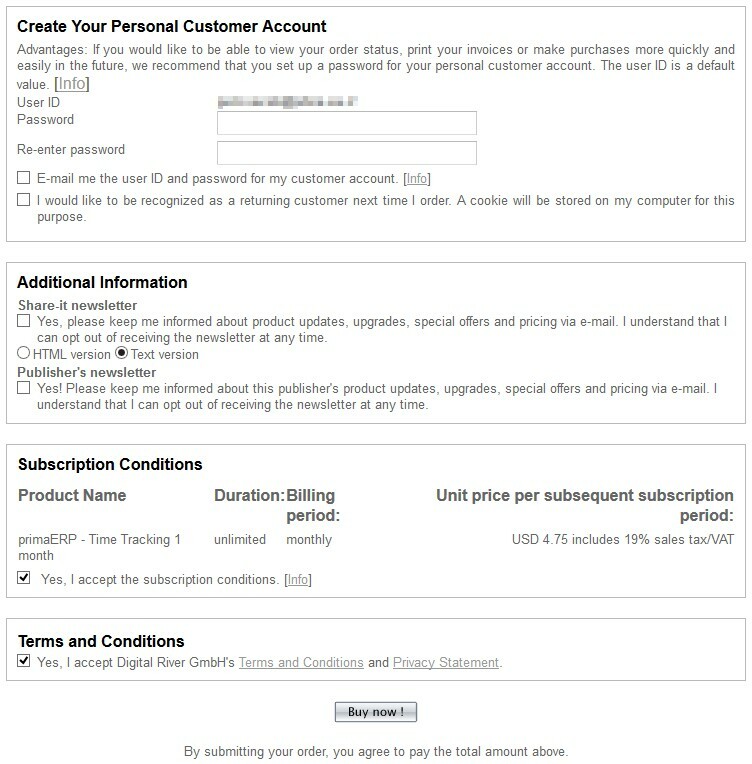 How to cancel the subscription? By clicking this button,you will cancel your subscription. Warning! There is no confirmation request for the cancellation. Once you click the button, the subscription will be cancelled immediately! The cancellation means, that no more payment will be made next month / year. At the end of the paid period (month / year), the number of accesses will be decreased in the application to the free number of accesses (3 TIME TRACKING, 1 BILLING). No data will be lost. If you decide to buy and add new accesses anytime later, you can easily get back and go on working with all data kept. The latest added accesses will be removed from users. You’ll receive an e-mail confirming the subscription cancellation. In case you are having problems cancelling your subscription, you can also contact our support and we can cancel the subscription for you too. 10. My subscription was cancelled by mistake, what to do? Sometimes it can happen, that your subscription was cancelled unintentionally, usually the reason being the bank declines the payment for some reason (payment limits, temporary lack of money, other security reasons). But you want to go on with all the users and all bought accesses. What to do? If the automatic attempt to charge a credit/debit card fails, you will receive an e-mail from Share-It informing that it was not possible to charge the card and that the subscription therefore has been cancelled. We also obtain information every time a subscription is cancelled and our support will contact you, inform you about the cancellation and ask you for the reasons. We do this so that you will be informed, that there was a problem with the payment. Please get in touch with our support and explain the situation, that the cancellation was unintentional. The only way to continue, is to buy the accesses again, which means ordering a new subscription. If your problems with the bank payment can’t be resolved immediately, please tell our support. We can help you with free accesses for some short time, until you’ll be able to realise the new subscription payment. 11. How to extend/change number of accesses? 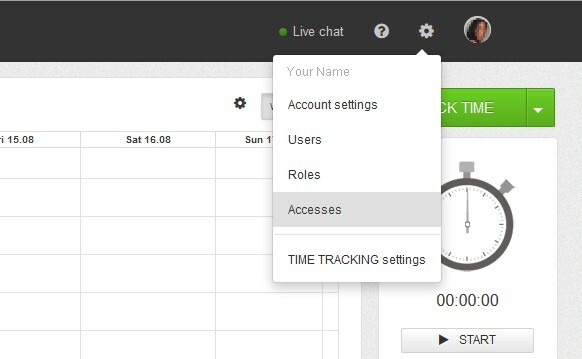 Let’s suppose you already bought 3 accesses for primaERP TIME TRACKING. Now you decided to use it for another 2 people in your company. You need 2 more new accesses. What to do now? to order a new subscription for the 2 new users. After doing so, you will pay 2 separate payments – one for the first 3 accesses and one for the 2 new ones. You can extend the accesses for the annual subscription in the same way. 12. How to consolidate several subscription into one? if you have several payments for accesses due to multiple access extensions (after using the first option), we recommend you to consolidate it into one. The way how to do it is simple, but also not easy. You have to cancel all your existing subscriptions and make one new order for all accesses together. This is also the right time to think about an annual subscription instead of the monthly, which is also more favourable for you. If you decide to consolidate your subscriptions, please inform us in advance, so we know the reason for your subscription cancellations. If you have any other questions about ordering, payment and delivery, don't hesitate to contact our support.